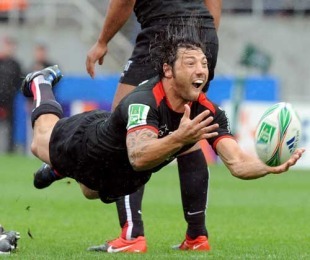 Stade Francais have confirmed the signing of former All Blacks scrum-half Byron Kelleher for the 2011-12 season. The 34-year-old had been set to join fellow Top 14 Orange competitors Bayonne, but the ambitious Basque club confirmed that his pre-contract had been torn up earlier this week. Kelleher joins Stade from Toulouse, where he featured since 2007, and the 57-cap All Black will be joined in Paris by Paul Warwick and Paul Williams. Warwick joins from Munster, where he had a decorated career winning the Heineken Cup in 2008. Williams, meanwhile, journeys across the channel from Sale after just one season in Manchester. Another face confirmed to be joining Stade is 20-cap Wallaby Morgan Turinui. Wednesday's announcement comes hot on the heels of a number of player signings by the club. They include French international Olivier Milloud, Stan Wright, Scott Valla, Felipe Contepomi and Paul Sackey. Stade also confirmed yesterday that bulldozing centre Mathieu Bastareaud will be staying in Paris, however, Toulon president Mourad Boudjellal, who attempted to lure Bastareaud south, believes the 22-year-old is no longer 'psychologically able' to play for Stade. Boudjellal told Le Monde: "I think that psychologically, Mathieu Bastareaud is no longer able to play for Stade Francais. He is a young player who now suffers from depression. "Stade Francais are a great club and Laporte is a child of that club and he will be a great president, but he must understand his players and it was not worth saying anything."